Is it a liquid or a solid? Giving children an opportunity to play with interesting materials in an open-ended setting allows them to develop observation skills, problem solving skills and methods of experimentation. 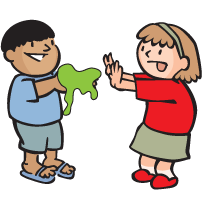 The material used in this activity, “Oobleck”, is made from ingredients found in most kitchens. Create one bucket or large bowl of Oobleck. Put 10 cups of water into the bucket or bowl and empty 6 of the boxes of cornstarch in with the water. Now for the messy part—mix it with your hands. You’ll notice that it gets thicker the harder you stir—mix the starch and water together gently, pulling extra starch up from the bottom. When it seems like the mixture is even, set it aside. Adjust the mixture by adding water or cornstarch (the extra boxes of cornstarch are for thickening the mixture). It should feel solid if you move your finger along the surface, but if you pick it up and hold it, it should drip through your fingers. Cover the tables or desks in newspaper—this activity gets messy! You can also make smocks for yourself and your students out of large trash bags. Cornstarch cleans up easily with water, so don’t worry too much. You can also play with Oobleck outside—it is a natural, biodegradable material, so it’s OK if it falls on the ground. A few minutes before you start the activity, re-mix the Oobleck—Oobleck can separate if it sits for too long. Ask your students if they have ever done any experiments before. What sorts of things did they experiment with? Tell them that today they will experiment with a substance called Oobleck. Tell them that you don’t know a lot about it, and you’d like them to play with it and share their discoveries with you. Play with this mystery substance and see what you can learn about it. Have your students work in teams of 3 or 4 for this activity. Hand out at least one bowl and one plate to each team (2 of each is ideal). Also distribute spoons, craft sticks, cups and any other tools you have available for them to explore with. Scoop 1–2 cups of Oobleck into one of each team’s bowls and invite your students to simply play around with the substance. What can they learn about it? Do they observe anything interesting or surprising? Have them record their observations. After your students have experimented with the Oobleck for about 15 or 20 minutes, have them take a break and come together to talk about what they’ve discovered. Create a list on a piece of chart paper or a chalkboard of the things that they discovered about Oobleck. Then ask your students to list some other things that they might like to find out by playing with it some more. Have your students return to the Oobleck to answer some of the new or lingering questions. When they are done, have them help you clean up, then ask them to add to your list of what you all know about Oobleck. Potato flour will work if cornstarch is unavailable. Cleanup: DO NOT POUR OOBLECK DOWN THE DRAIN!!! It can clog your sink. Instead, leave it out to dry then throw out the chunk of dried Oobleck. You can also “remake” dried Oobleck by adding water to it. Another cleanup hint—if any Oobleck spills on the table or on the floor, first pick up as much of it as you can and put it in a bowl or bucket to dry. Wipe up anything remaining with a sponge. Trying to mop up large spills will make a real mess. For more information on the science behind Oobleck, see this page on Wikipedia. As an introduction to this activity, read the Dr. Seuss book “Bartholomew and the Oobleck” to your students. For a great classroom series of activities with Oobleck, check out the GEMS curriculum “Oobleck: What Do Scientists Do?”, from Lawrence Hall of Science.